Despite the popularity of caffeine- and sugar-laden energy drinks, their adverse health effects are leaving a bad taste in doctors’ mouths. 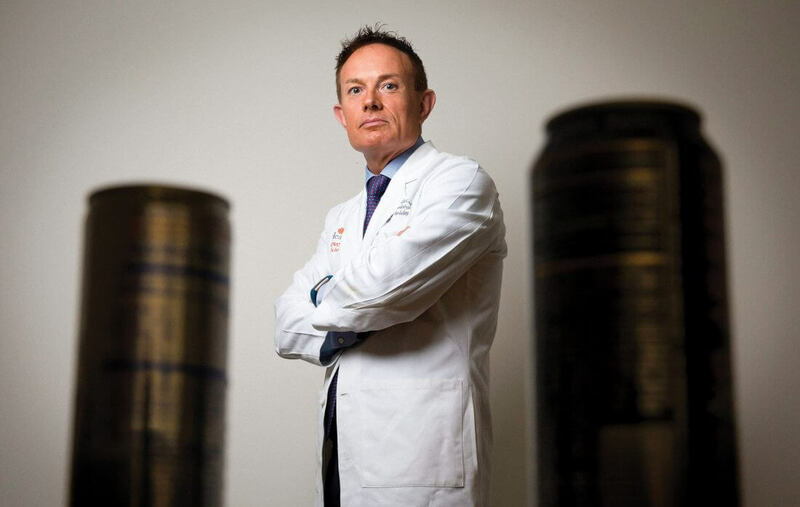 John Higgins, M.D., a sports cardiologist at McGovern Medical School at The University of Texas Health Science Center at Houston (UTHealth) and a member of the American College of Sports Medicine (ACSM), said athletes often ask him and his colleagues about energy drinks. Is it healthy to consume them? Do they really improve athletic performance? The popularity of energy drinks in the United States surged between the late 1990s and early 2000s, when major companies—including Red Bull, Monster Beverage Corp. and Rockstar Energy Drink—introduced highly-caffeinated beverages laced with a cocktail of vitamins and herbal ingredients to give consumers a boost of energy. Advertisements for these drinks promised to enhance athletic performance and improve mental sharpness. One ad suggested that consumers would feel energetic enough to fly. Over the years, people grew increasingly thirsty for energy drinks, and beverage companies upped their game to meet the high demand. Between 1999 and 2014, energy drink sales in the U.S. skyrocketed 5,000 percent, according to data from market research firm Euromonitor International. Sales have tapered off in recent years, but energy drinks remain popular among teenagers, high school and college students, athletes and office employees who want to push through a workout or avoid the mid-afternoon slump. Yet there is limited data on the health risks surrounding energy drinks. In 2010, Higgins launched an investigation into the popular beverages. His research showed that energy drinks have an adverse effect on the cardiovascular system and can cause neurological, gastrointestinal, renal and endocrine system problems, as well. Higgins’ findings were used as the basis for an official statement recently released by the ACSM, announcing new recommendations and warnings for energy drinks. A majority of volunteers who participated in Higgins’ study experienced arterial endothelial dysfunction, a condition in which the arteries are unable to open properly for blood to flow, after consuming an energy drink. Pair that with arduous physical activity or exercise—when the heart demands more blood flow—and a serious cardiac event could arise. “There’s going to be a flow-demand imbalance—the classic setup for ischemia—in the heart muscle, which we know can lead to things like ventricular tachycardia, ventricular fibrillation and sudden cardiac arrest,” Higgins said. A 2014 report by the Substance Abuse and Mental Health Services Administration found that the number of emergency department visits among patients age 12 or older involving energy drinks—either consumed alone or in combination with alcohol or other drugs—doubled from 10,068 in 2007 to 20,783 in 2011. In this group, 1 in 10 energy drink-related emergency department visits resulted in hospitalization. The ACSM issued four recommendations around energy drinks: protect children and teens who are at high risk of complications from energy drinks; stop marketing to youths; do not use energy drinks before, during or after strenuous exercise; and increase education and research to better understand the safety and efficacy of energy drinks. The growing number of cardiovascular incidents involving energy drinks demands further research into the ingredients packed into each can, as well. “You read the label and it’ll say 50 to 100 mg of caffeine, but I think it’s the other ingredients in there that are almost like caffeine—the guarana, the ginseng, the taurine—which we can’t really put an amount to or know exactly what they do,” Lapus said. Because of the regulatory “labeling runaround,” Higgins said, energy drinks lack transparency. The classification of some energy drinks as “dietary supplements” allows energy drink companies more latitude in terms of which ingredients and how much of each ingredient they can add to their product, he said. Some energy drink companies—including Monster and Red Bull—converted from dietary supplement to beverage, but not all have made the switch. One specific ingredient in question is taurine, an amino acid naturally found in meats and fish. Some energy drinks contain up to 2,000 mg per can of taurine, which can have an adverse effect on cardiovascular function when combined with caffeine. Some countries in Europe have cracked down on energy drink sales to minors. In 2016, Latvia banned the sale of energy drinks to children 18 and under, and earlier this year, the United Kingdom banned supermarkets from selling energy drinks with more than 150 mg of caffeine per liter to people under the age of 16. Higgins said he’s not looking to put energy drink companies out of business, but he hopes the U.S. will follow suit and stop kids 18 and under from putting their health at risk until more information about the long-term health effects is known.